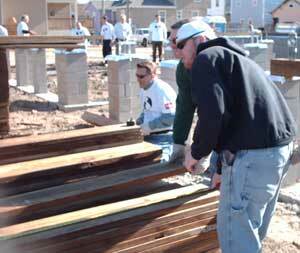 Jerry Langreder (center) and Nick Magnuson (right) discuss plans with their Habitat for Humanity foreman. WSU turf management program seniors Jerry Langreder and Nick Magnuson traded golf clubs for hammers while volunteering for Habitat for Humanity in hurricane-devastated New Orleans. The pair volunteered their time prior to the national meeting of the Golf Course Superintendents Association of America (GCSAA) and Golf Industry Trade Show last February in New Orleans. For one day, Langreder and Magnuson helped build a subfloor on one home’s concrete blocks. “Many, many, many nails are used in building a Habitat for Humanity house,” said Magnuson. He retold his foreman’s story in which a pilot surveying Katrina’s damage was surprised to find a block of houses still standing within one particular area of devastation. It was later discovered those homes were built by Habitat for Humanity. The foreman explained that the extra nails were a significant factor in helping hold those homes together compared to a typical build. Nick Magnuson selects lumber to use in framing the subfloor. Finished Habitat for Humanity homes are shown in the background. “To support their first-ever volunteer project, GCSAA made volunteering simple by allowing members to sign up online along with their conference registration,” explained Matt Williams, WSU Turf Management Program advisor. GCSAA reports there were close to 200 volunteers who worked on eight homes during the two days. In addition, trade show partners and volunteers donated more than $10,000 to help the restoration. 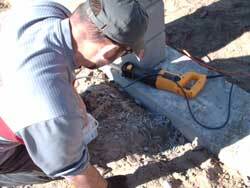 Jerry Langreder works to fasten cleats to the concrete footings. Langreder, who rallied WSU’s effort for Habitat for Humanity, has seen similar devastation and rebuilding in his 16-year career in the U.S. Marine Corp, where he helped rebuild the island of Kauai, Hawai’i, following Hurricane Iniki in 1992. Magnuson, on the other hand, was compelled to witness first hand not just the devastation, but also the amazing recovery. “All around, it felt good to give back to a community that was so heavily damaged” said Magnuson. 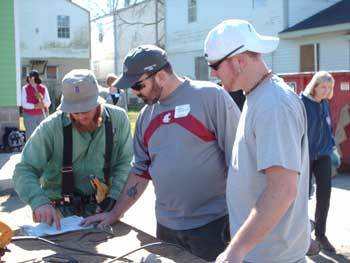 WSU’s Turf Management Program is in the Department of Crop and Soil Sciences. Check out this short video featuring one of our graduates on the job. This is just one of many videos available on our YouTube channel.